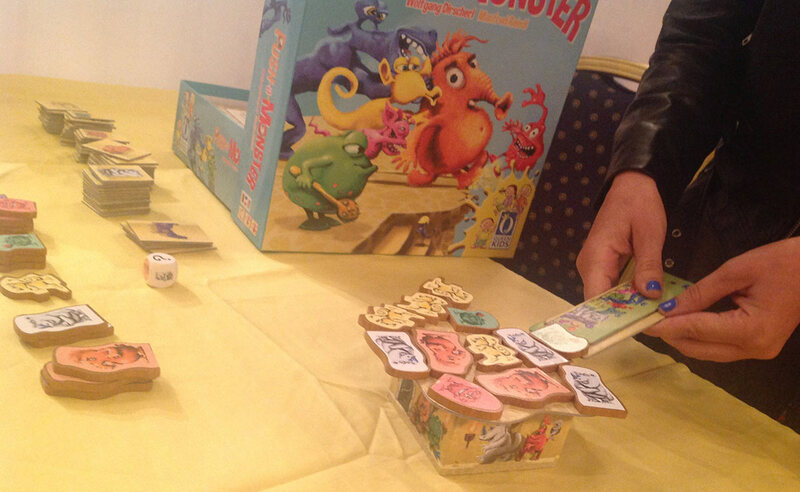 Hot Previews from the UK Games Expo! Quinns: Hello everybody! I’m coming to you live from SU&SD’s sealed Con-Tamination Chamber, where I’ll be sitting until any convention germs I’m carrying are long gone. It’s nice in here! It looks a lot like Matt’s bathroom, actually. Matt might have just locked me in his bathroom. I’m not sure. He pushes a slice of toast under the door twice a day. 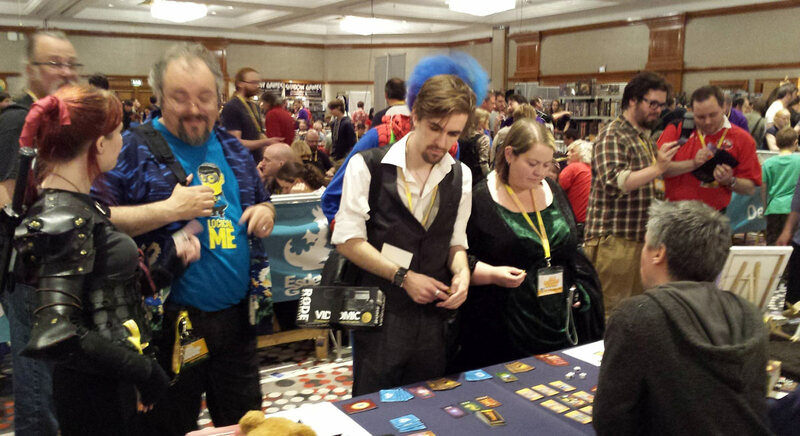 I was at the UK Games Expo this weekend, while I heartily recommend to anyone who’d consider going. It’s grown considerably in recent years, and it was a lovely space to buy games, try games, and attend all sorts of special events. Today I want to tell you about the best unreleased games I got to see there, including a new Vlaada Chvátil party game! Oh, yes. I had a chat with the lovely Eric Lang (Chaos in the Old World, XCOM) about this game, and he said it was the consequence of Vlaada making super complex games in recent years, like Tash-Kalar and Mage Knight. He wanted to make something simple. My god, did he ever succeed! This game was all my friends wanted to talk about. Codenames is a team game played with a 5×5 grid of words. 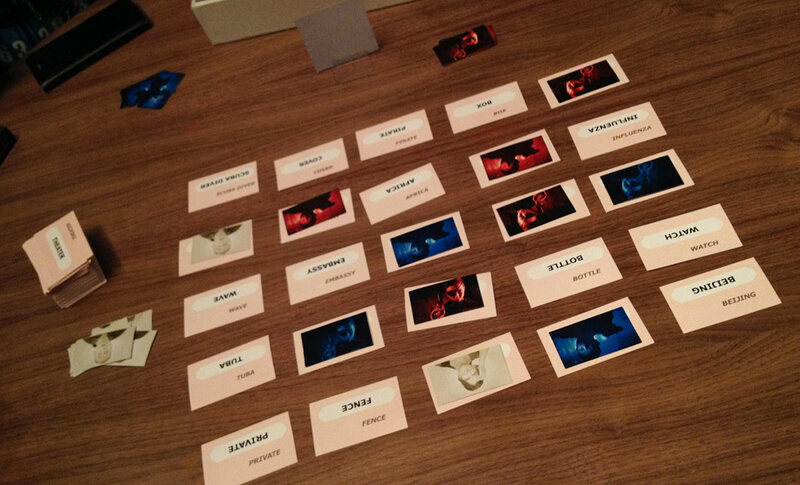 Using a tiny stand, the team captains can see which words are their colour, which words belong to the other team, which words are neutral and which word is the assassin. The game is simple. The team captains take turns saying a single word and a number, for example “Safari 3”. That would mean that three of their team’s words relate to safaris. The team proper (which might just be one person) then has to point to words on the grid, as if they were playing minesweeper. Whatever they point at is covered with that word’s colour- red, blue, or white for neutral “civilians”. This keeps going until they point at a word that isn’t their colour, or choose to stop. The team to get all their colours on the board first wins, but if a team points to the assassin word then they lose the game instantly. And it’s perfect. At the start, 25 words is enough to engage you utterly. As you cover words up the game speeds up, but the team captains are becoming increasingly scared of the murder-word and the players are trying to remember all the clues they failed to guess, which are still on the board. Plus it’s just an awesome game of risk vs. reward. I was losing in one game when friend of SU&SD Leigh Alexander said “Heist 4”, and across a terrifying minute I managed to guess “Embassy”, “Fence”, “Genius” and “Door” in a single turn, putting us back in the game. It’s funny, too, in much the same way Mysterium is funny- you need to communicate something desperately important and you can’t. Except here you’ve got a whole team of other players delighting in your agony. Codenames is scheduled for a Gen Con release, and we’ll be bringing you the earliest possible review. 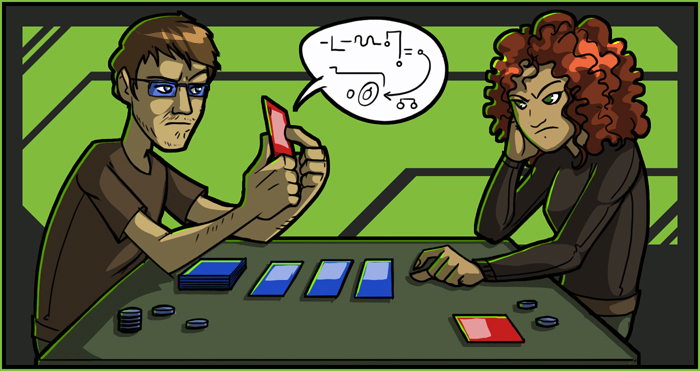 A card is drawn showing what’s happening at sea. Players roll delicious little candy dice in the box lid. Players then play something like a miniatures game in a teacup, with ships being able to move the length of a card and shoot the width of a card. Do it again, and again! Looting and shopping in a little pirate’s market! 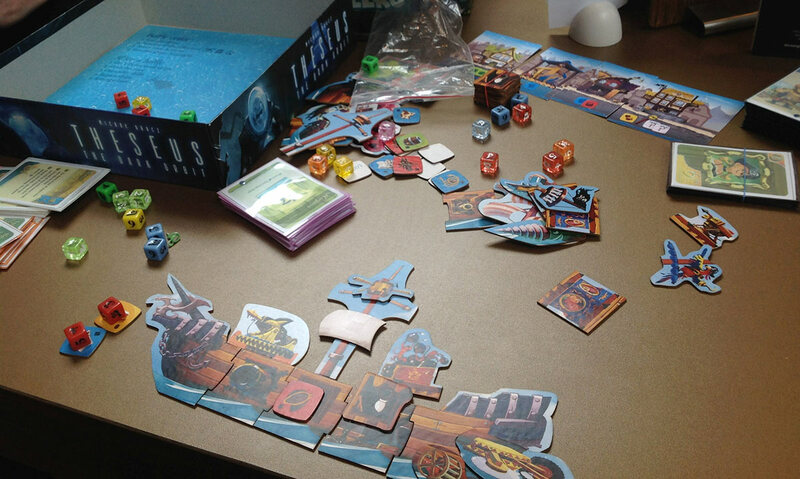 Players expand their modular cardboard ships, growing them longer, adding sails and cannons and bolting on special gear as if you were playing with two-dimensional lego. It all seemed clever, fun and different, and looked absolutely beautiful. Portal Games are making some darn pretty boxes these days. Dr. Congo was Kickstarted earlier this year. Development is continuing on schedule and a prototype was present at the convention, so I got a brief overview. 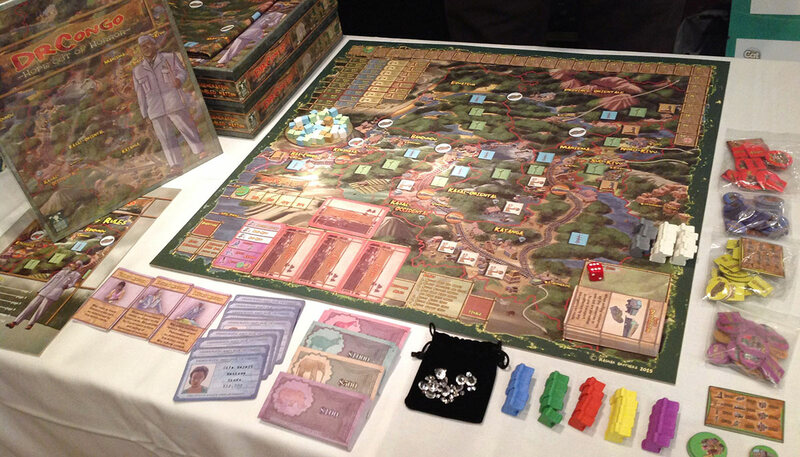 It looks lovely and it sounded nice enough – I love the art, and I like that it’s a game of economic development where neutral guerrillas can spread across the map and undermine development on the board – but I’m mostly including it here because its theme makes for an interesting counterpoint to the theme of colonialism, which is very common in board games. DRCongo actually starts in the 1960s, after 80,000 Belgians were forced out of the Congo during a rebellion. The more obvious, traditional theme for a board game would be the colonisation of an African country. Playing as Congolese politicians trying to develop their country after independence makes a nice change! 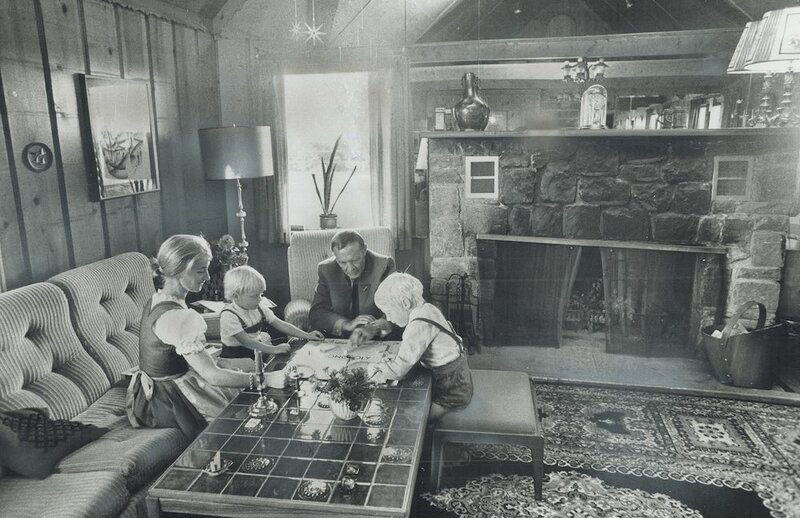 Let’s be clear: There’s nothing inherently wrong with the theme of colonialism in a board games, same as there’s nothing wrong with the theme of wargames. 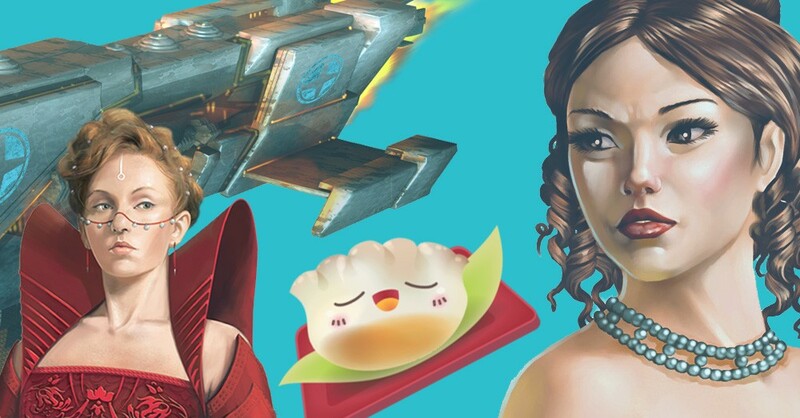 What we shouldn’t be encouraging is games that unthinkingly use sensitive imagery, in case they appear to condone it. That’s all. I was really tired on Friday morning and Push a Monster was there for me. A game where you have to push a monster onto a thing but not push any monsters off the thing. It actually came out this year? Maybe buy Push a Monster if you wanna push a monster. 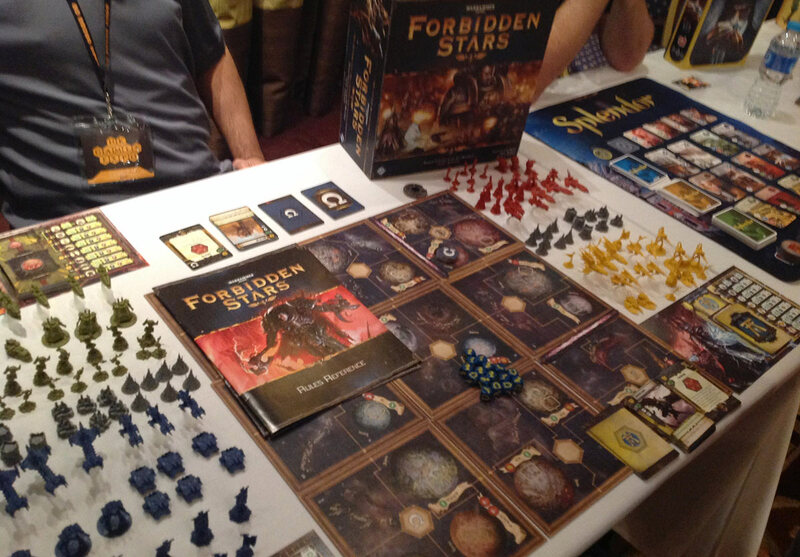 I wasn’t that excited about Forbidden Stars, the Chaos In the Old World-like attempt to offer a grand old strategy game within the Warhammer universe, though this time in the sci-fi darkness of Warhammer 40,000 rather than Fantasy. Over the weekend I saw it in the flesh. And… yeah. We’ll need to take a look at this one. Not only is it a stunning collection of objects, Fantasy Flight CEO Christian Peterson warmed me up a bit by telling me it had been in development for three years. In the Grim Darkness of the Future there is only… Quinns!